The Seminar Collection is made of the five Seminar eBooks which are each from a half-day module of my In-depth Seminar, The Innkeeping Balancing Act: Business vs Hospitality, on being a successful B&B innkeeper. Information found in my eBooks is based on what I’ve learned from innkeepers across the U.S. and Canada, as well as Europe. I’ve learned from successful and struggling innkeepers alike. Absorb details that will help you gain profits more readily. Understand your strengths and weaknesses so you can buy the “right” B&B and develop the business that suits your style. Learn what the B&B experience means to you so you can attract guests who want what you will offer in ambiance and hospitality. Ascertain how the B&B trends will shape and support your bed and breakfast operations to better success. A strong foundation creates a stable and viable business model from which you will enjoy and profit. Start with the Foundation eBook for the rudiments of your success. Research your business concept to make sure you get the results you want and deserve. Evaluate whether the location and the number of guestrooms you are considering will allow you to make the money you desire. Hone your market niche for success. Solid research lets you modify your plans before you put money into the project and to create a profitable situation. This eBook is your planning guide. Ascertain if you have the money you need to buy and create the bed and breakfast you desire. Understand how you’ll create income and manage expenses to generate a bottom line that’s viable for you. Contemplate other income streams you can produce from your B&B operation so you make even more money. Money is at the core of your B&B decision. Do you have enough and can you make enough are the basics of that decision. 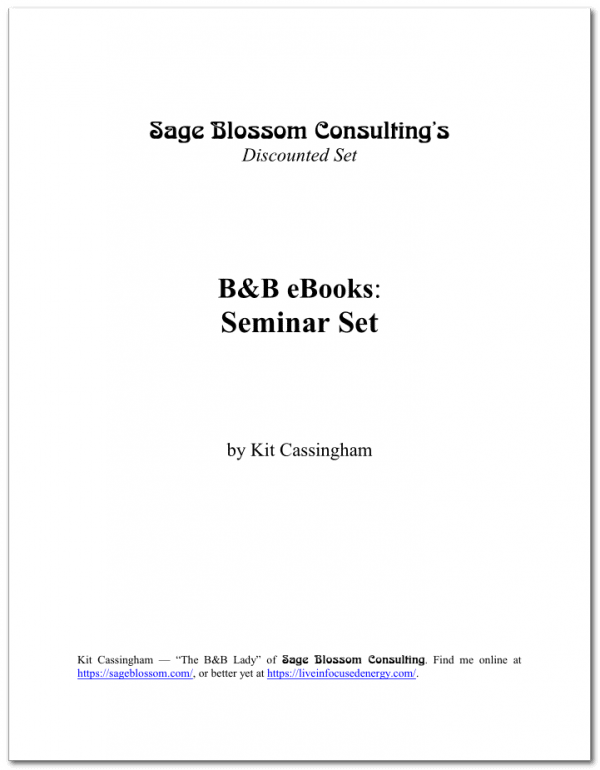 Use the Money eBook to ensure your B&B business’ financial health. Brand your inn to attract the people you enjoy serving, creating more success with less effort. 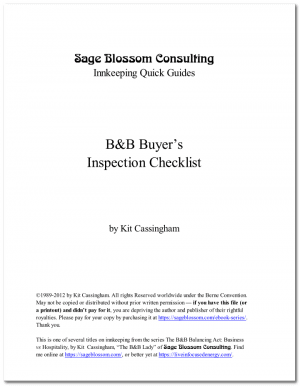 Learn where to promote your B&B and how to do it most effectively. Write a viable marketing plan to map out your successful path. Your marketing budget is closely aligned with your success; it’s sacred and can’t be trimmed when money gets tight. 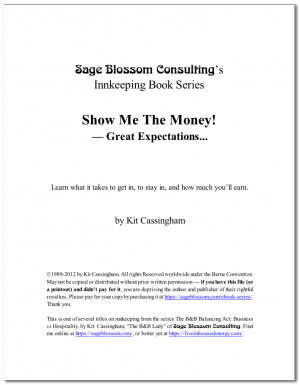 The Marketing eBook will share secrets you can “take to the bank”. Create an organizational structure and routines that supports your operations and brand. Determine who you will allow to answer your business phone. Analyze whether your amenities and hospitality gestures reflect your stated guest experience. Balancing business and hospitality is the challenge of innkeeping that separates success innkeepers from everyone else. 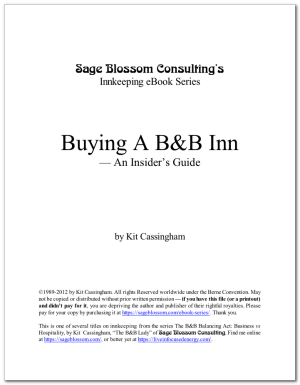 This eBook will help put you in the category of successful bed and breakfast innkeeper. …which were developed for those wanting some quick assistance in a specific area. Don’t recreate the wheel: learn from successful innkeepers who have gone before you. Use the checklists and manuals as templates. The provided examples will fill in the gaps of your knowledge and spark your imagination for ways to improve your bed and breakfast business. Streamline your employee training and daily operations. These job descriptions and checklists will help you organize your days and employees. 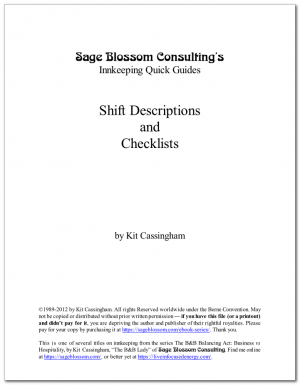 Enhance your hospitality and service with the consitency that comes from using checklists. Airline pilots use checklists to ensure all details are attended to for a successful flight. Their wisdom is now yours. Augment your operations and training with thorough manuals covering how to run the inn. Dump your brains onto paper so others know what you know about running and managing the inn. You’ll step away from the inn for any number of reasons — vacation, illness, or emergency. These manuals will let others step into your shoes to keep the inn going as if you were there. Ensure your business viability as you ease your mind by creating your own Operations Manual with the help of this Quick Guide.